The ancient wine region of Chianti is a “must do” for wine lovers. Chianti Classico, the subregion of Chianti most highly regarded, is located halfway between the gorgeous Tuscan art cities of Florence and Siena. Chianti is an idyllic wine region, exactly how you imagine fairy tale wine country-complete with castles, hilltop villages and vine-covered valleys. The best wines of Chianti Classico are rich red wines, made with the native Sangiovese grape. Many of the cellars date back hundreds of years and are extremely atmospheric with wine caves and pretty tasting rooms. You can begin this tour either in Florence or Siena. Your private chauffeur will collect you from your hotel and you will enjoy a very scenic drive through the delightful Tuscan wine country, before reaching your first destination: one of the most beautiful and prestigious producers in the whole Chianti Classic region. Unlike other tours, where you are one of a group of 30 guests, on our VIP tours, you will be privy to a private visit to the estate, greeted like family and you will enjoy a professional tour. You will begin in the vineyards and receive an explanation of the terroir- the combination of local climate, soils and grape varietals that are the components that make wines so unique from region to region. A tasting will follow of up to 6 of the classy wines. For Olive Oil lovers, we have a special treat- a professional olive oil tasting, extremely interesting. You will learn how the whole process works and taste marvelous oils. Before leaving, you will receive a gourmet gift. After all of this hard work, you will be ready to have lunch and your guide will take you to a fantastic local Trattoria to taste the best Chianti has to offer- Bruschette (rustic bread dripping with extra virgin olive oil, basil and ripe tomatoes) Pappardelle a la Lepra (long flat pasta with wild rabbit) and various regional specialties. “Riserva” style wines will be enjoyed with the meal, with zippy whites from San Gimignano as an aperitif. Vin Santo and Cantucci-dessert wine and Tuscan cookies will finish off this amazing meal. 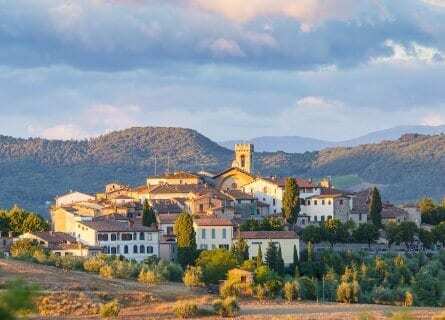 Following your delicious wine lunch, you can take in an excursion to a charming Tuscan village before returning to your hotel. If staying in Florence, you can visit the medieval walled village of Radda in Chianti, before your return. Radda is lovely, and has plenty of gourmet shops should you want to pick up some nice bottles or decanters on your gourmet day out. If staying in Siena, we will take you to the fantastic walled village of Monteriggioni. Monteriggioni is such a gorgeous little town, another “must see” if you will be visiting nearby Siena. Your guide will show you around the town, and you can relax at a wine bar, go gourmet shopping, or just enjoy the atmosphere. Evening transfer to Florence or Siena. Our Gourmet Wine Tour was absolutely FANTASTIC! Natalie, our guide, was very knowledgeable, very friendly and extremely enthusiastic. Our ‘hosts’ at each winery were very cordial and made us feel very welcome. They were very relaxed and did not try to rush us through and out the door. Our ‘lunch’ was more like a five-course dinner than lunch. Everything was excellent. Our daughter and Natalie are vegetarians and the owner/chef came out from the kitchen to make sure the vegetarian dishes were acceptable. The wine tour was definitely a highlight of our trip. We all enjoyed it immensely and would highly recommend it to anyone.